The Greater Blue Mountains Area (GBMA) is a deeply incised sandstone tableland that encompasses 1.03 million hectares of the eucalypt-dominated landscape just inland from Sydney, Australia’s largest city, in south-eastern Australia. Spread across eight adjacent conservation reserves, it constitutes one of the largest and most intact tracts of protected bushland in Australia. It also supports an exceptional representation of the taxonomic, physiognomic and ecological diversity that eucalypts have developed: an outstanding illustration of the evolution of plant life. A number of rare and endemic taxa, including relict flora such as the Wollemi pine, also occur here. Ongoing research continues to reveal the rich scientific value of the area as more species are discovered. The geology and geomorphology of the property, which includes 300-meter cliffs, slot canyons, and waterfalls, provides the physical conditions and visual backdrop to support these outstanding biological values. The property includes large areas of accessible wilderness in close proximity to 4.5 million people. 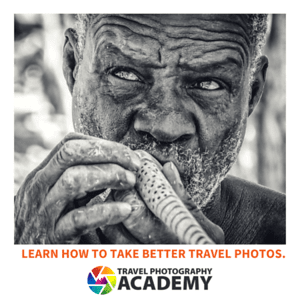 Its exceptional biodiversity values are complemented by numerous others, including indigenous and post-European-settlement cultural values, geodiversity, water production, wilderness, recreation and natural beauty. 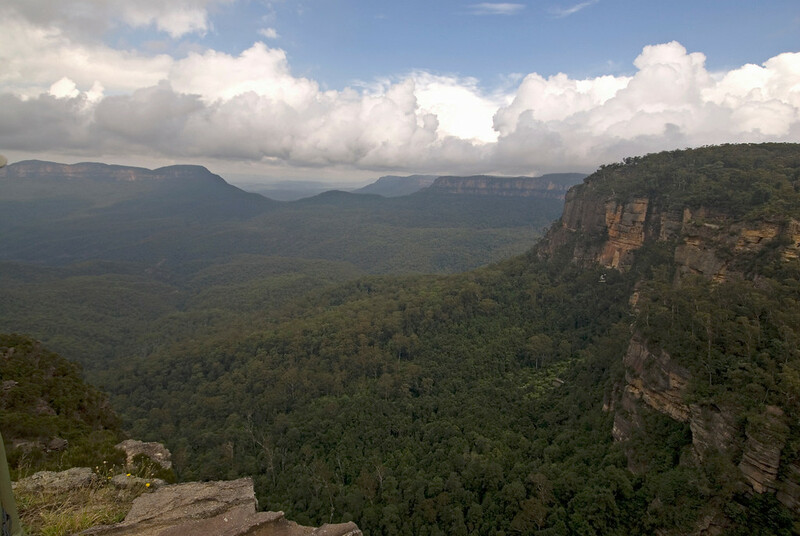 Katoomba and the Blue Mountains National Park is about an hour outside of Sydney. The amazing thing about Katoomba is that the town is located right on the rim of a canyon, which is one or the largest canyons in the world. You can literally walk through town and look out over the edge of the canyon. 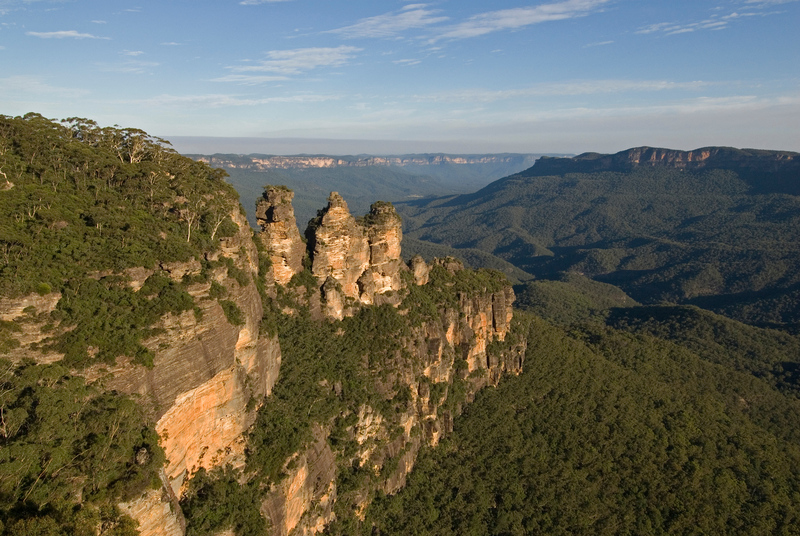 The most prominent feature in Katoomba is the Three Sisters (shown above). In addition to the Three Sisters, you can take cable car rides to the bottom of the canyon where are the walking trails, several waterfalls, as well as hiking trails near the canyon rim. The Blue Mountains is a must see for anyone visiting Sydney. You can easily take a train or drive to Katoomba from Sydney for a day trip. 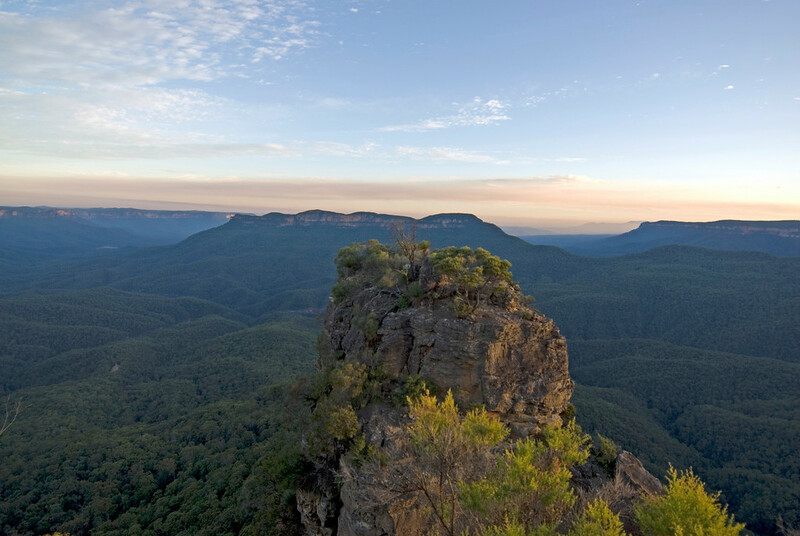 The Greater Blue Mountains Area in New South Wales, Australia is one of the state’s most notable tourist attractions. Aside from being a UNESCO World Heritage Site, it is also unique in that it is a deeply incised sandstone tableland. It covers more than 1.03 million hectares of the landscape that is dominated by eucalyptus trees within inland Sydney. 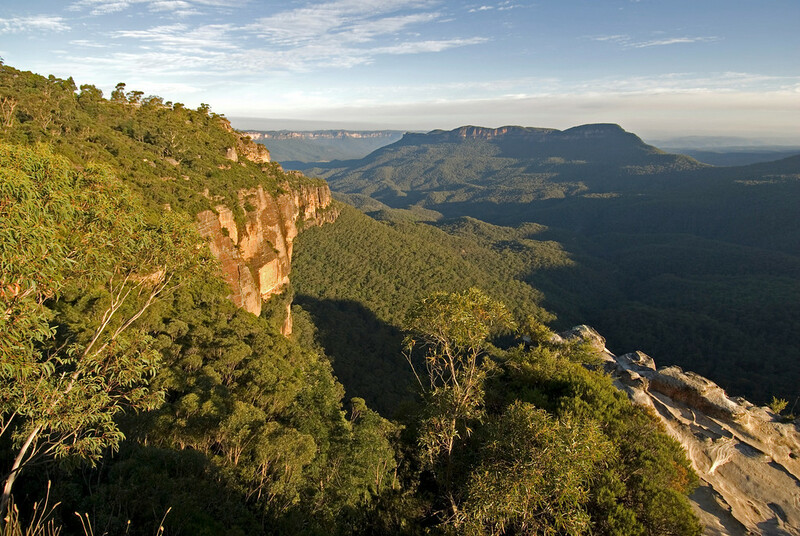 The area covered by the Greater Blue Mountains Area spans 8 adjacent conservation reserves. It also comprises some of Australia’s largest and protected bushland. Due to its ecological diversity and immense taxonomic features, it is quickly recognized by UNESCO for how it illustrates the evolution of plant life. If you are traveling from Sydney, the Great Blue Mountains Area is about two hours’ drive away. You can travel by car but there is also an option to travel by train or coach tour. The Sydney Airport is located about 1 hour and 30 minutes from the Blue Mountains. As mentioned above, the Greater Blue Mountains Area consists of rugged sheer cliffs, tablelands, rivers, lakes and inaccessible valleys. All of these land features are teeming with life and is one of the most beautiful yet inhospitable parts of Australia’s New South Wales. There are also several plants and animal life that thrive in this natural place that exhibits Australia’s antiquity (more on that later). With a total land area of more than 10,300 square kilometers dominated by forested landscape, the Greater Blue Mountains Area is approximately 60 to 180 kilometers from the Sydney CBD Area. It is a vast expanse of wilderness that is twice the size of Brunei. It is dubbed as “Blue Mountains” because of the visible spectrum of blue light that is propagated by the mountains as impacted by the atmospheric temperature and essential oils from the eucalyptus trees dispersing into the air. Aside from the 7 national parks listed above, the Greater Blue Mountains Area also includes the famous Jenolan Caves Karst Conservation Reserve. Even though it is dubbed as the Blue Mountains, the world heritage site does not consist of mountains in the most basic sense of the word. These are sandstone rising plateau that rise over 100 meters above sea level (in their highest point). Aside from the thick vegetation and diverse landscape, there are various fauna species that thrive in the Great Blue Mountains Area. There are about 400 different kinds of animals that live within the rugged landscape of the Blue Mountains’ gorges and tablelands. These animals include both rare and threatened species such as the long-nosed potoroo, koala, tiger quoll, and yellow-bellied glider.